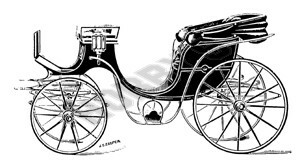 The Victoria was a favourite open carriage with the fashionable ladies who liked to take a daily drive in Hyde Park, and styles changed to keep in vogue. It is a rounded deep quarter type. Having no doors the contruction is considerably simpler than that of the Landau.